Here’s a movie that should, by most accounts, work. It’s got a fantastic cast, a talented director, competent writers, and even Martin Scorsese has an executive producer’s credit, not to mention it’s based on an acclaimed book by Jo Nesbø and the first major adaptation of his popular series featuring the lead character of Harry Hole, something that fans have been eager to see for a long time. With those credentials, The Snowman should at the very least function as a competent movie… but for whatever reason, it just doesn’t, and part of the mystery while watching this baffling mess of a film is figuring out how, and why, something with this much talent involved could be so poorly handled, let alone released into cinemas nationwide in the convoluted state that it’s in. Set in Oslo, Norway, we learn that a number of women, all of them with children, have gone missing and later shown up dead. 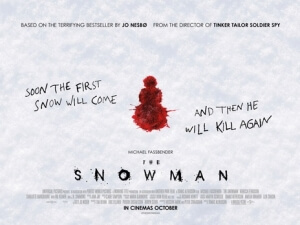 Accompanying all of their murders is a hastily-built snowman, which leads to detective Harry Hole (Michael Fassbender) heading the case and piecing together all of the clues before the killer strikes again. And if you think this is all going to lead to a supernatural twist where it turns out that it’s actually the snowman who’s somehow come to life and started murdering random mothers, then you would sadly be very much mistaken… although given the blatant stupidity on display in this film, it wouldn’t be at all surprising if that actually did happen. This film is so utterly ridiculous and nonsensical it’s hard to imagine why anyone involved would take it as seriously as they do, as often it can get so dumb and have its characters do incredibly stupid and unprofessional things that it all borders on self-parody. The opening scene, a flashback to the killer’s unhappy childhood with a cartoonishly vulgar and abusive father figure and an unintentionally humorous scene involving the fate of their mother, doesn’t so much set the tone but offers many different tones all at once for the remainder of the film to pick and choose to be whenever it wants, to the detriment of its own storytelling abilities. It is at once a serious crime thriller that’s far too silly to be serious, a cliché-ridden redemption story about the central cop who’s (what else?) an alcoholic and a deadbeat dad whose family plays a major part in the film’s climax, and even a cheesy slasher movie where the deaths get sillier with each kill, and it somehow fails to pull any of them off. What you’re left with is a film that was clearly hacked to pieces during post-production, rendering certain scenes and even characters completely pointless (you get the feeling that a lot of material was left on the cutting room floor, and the things that remain feel barely complete due to the extra information surrounding them having vanished), and even to a point where there are scenes that appear in the trailer that are either alternated or scrapped entirely, which makes the promotional material rather misleading. I refuse to believe that a director like Tomas Alfredson, who in the past has shown that he is a strong director with films like Tinker Tailor Solider Spy and Let The Right One In under his belt, would willingly sign off on his own film being neutered this strongly in the editing room, so it’s more than likely that for whatever reason the studio tried to trim it down but in doing so turned it into even more of a mess than they probably thought it was to begin with. It’s a film so clearly tampered with in post-production that anybody in their right mind who worked on this film would be embarrassed by the absolute butchery of tone, plot, character etc on display, especially considering that a lot of the people working on this movie are genuinely talented. The cast, for example, is fantastic and filled with great performers like Fassbender, Rebecca Ferguson and J.K. Simmons among others, all of whom are there to either blandly stumble their way through this shoddy adaptation, or act as severe red herrings to disguise the killer’s real identity, which leaves some of the bigger names in the cast with absolutely nothing to do or any real reason to be there. Worst of all, however, Val Kilmer – once a bankable A-lister despite a rotten reputation – pops up briefly in scenes where it doesn’t even look like he’s trying to act anymore, with his lines clearly dubbed over with highly noticeable ADR work, and acting as well as looking like if Tommy Wiseau got completely plastered after getting some noticeable botox while on set. How anyone could let this abysmal performance, which is actually quite saddening to witness, stay in the finished movie let alone actually film in the first place is just as big a perplexing mystery as the rest of this bizarrely muddled mess. I can’t say if the book is any better (I don’t have time to read everything, folks), but I’m going to make a wild guess and say that it is, because there’s no way it would be an international best-seller or even optioned for a movie adaptation at all if it had half of the stupidity they’ve conjured up here. Like the most feared of snowmen, it’s abominable. The Snowman is a fascinatingly botched mess of a movie, one that was clearly hacked to pieces by the studio despite the presence of a talented cast and crew, and contains such stupidity and clichéd story points that it’s almost as perplexing as the film’s central mystery as to why anyone would release this in the butchered state that it’s in.